PCWorld's January Digital Edition looks to Windows 10's next big reveal. 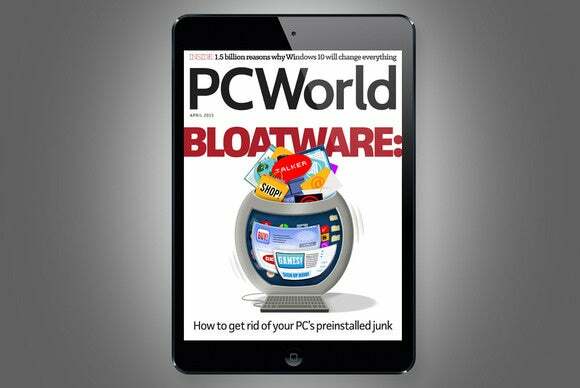 In our April edition, we tackle Bloatware and how to get rid of the junk. We also test Nvidia GeForce and AMB Radeon graphics card so you know what to expect for your money. Plus, we compare the battery lives of the Dell XPS and MacBook Air. • Troubleshooting Google Hangouts and ooVoo: We take on ten notable video and voice headaches. • 15 new Steam machines revealed: Valve bids to replace your living room console with a true gaming PC. • Mobile World Congress 2015: Our smartphone, watch and gadget picks. • Here's How: Nine ways to lock down your device before it goes missing. • Watch reviews: of the 15 new Steam machine, Asus ZeBook UX305F and the Dell Venue 8 7000. Current subscribers can visit PCWorld.com/directions to learn how to access PCWorld on any device and start reading the April issue right away.